What does Frameless Shower Enclosure mean? Some of our customers are confused at how a shower enclosure can be completely frameless. Our heavy duty hardware carries the weight of the glass, and we use a minimal amount of caulking to seal the glass to the tile. That means, when we say frameless, we mean completely and truly frameless. Check out our Photo Gallery to see some of our past work and our Truly Frameless page to see all the benefits of choosing a Frameless Shower Enclosure to make your bathroom's renovation complete. Why use 3/8” glass instead of 1/2” glass on the shower door? ShowerMan prefers to use 3/8” glass on the shower doors, while using 1/2” glass on the fixed panels and side returns, to increase the longevity of our product. By using 3/8” glass on doors, the weight is reduced by 25%. This leads to less wear and tear on glass hardware and fixed panels, which reduces the likeliness of the glass and hardware sagging over the life of the Frameless Glass Enclosure. We’ve found that by using 3/8″ glass on the doors, have resulted in less than 1% of service calls over the last 40 years. 1/2″ GLASS DOORS ARE SIMPLY TOO HEAVY. Best of all, 3/8” glass holds in the same amount of water as 1/2” glass. Combined with our expert designers and professional installers, choosing to use 3/8” on the shower door is one of the many reasons we can offer our unprecedented 15-Year Warranty. ShowerMan has been in business for over 40 years because we take the time to do our job right the first time. 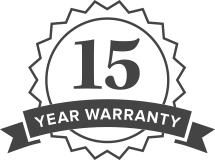 Our 15-Year Warranty doesn’t just mean that we have confidence in our product, but also that we will stand by the safety of our installation for 15 years. As an added safety feature, when shattered, tempered glass breaks into round pieces, reducing the risk of injury, as opposed to annealed glass which shatters into large, sharp chunks. Is a head rail necessary to ensure safety? Our hardware and installations are completely safe, have stood the test of time, and will do the same for you and your family. In certain situations, however, we do recommend adding a head rail for an added level of support. Mainly, this is when our customer is elderly, has young children, or a member of the family is handicapped. The head rail carries some of the weight of the glass door and fixed panels so that it is perfectly safe. In our opinion, if there is a potential risk, especially for the elderly or handicapped members of your family, then added precautions should be taken. The only other time we incorporate head rails into our frameless design is when there is no other way to secure the door or hinges. Why choose a Frameless Glass Enclosure? Bathrooms are becoming larger and more spa-like. When renovating your bathroom, you don’t want to sell your new oasis short by choosing the wrong doors. Frameless Glass Enclosures by ShowerMan have no tracks where soap scum and mold tend to accumulate. And, by choosing a professionally installed frameless shower enclosure, custom-designed for your specific bathroom, you’re choosing to create an open, airy space, completely transforming your bathroom. Can I afford a Frameless Glass Enclosure? In the past, Frameless Glass Enclosures were only for the wealthy. Now, any one can afford this perfect addition to their bathroom. Our team of professional designers and experienced installers come up with the perfect design to accommodate your needs and wishes to make your Frameless Shower Enclosure unique and personal. And, it comes with our unprecedented 15-Year Warranty. So, the real question isn’t whether or not you can afford a Frameless Glass Enclosure, but whether or not you can afford not to have a Frameless Glass Enclosure to complete the look and feel of your bathroom? How is ShowerMan different from a typical glass company? We all know the term jack-of-all-trades. With all due respect, a general glass company is compared to a general practitioner, while ShowerMan would be considered a specialist. Not only do our customers respect us as being the best, but also the glass industry recognizes ShowerMan as a specialist in the field. With over 40 years of excellence, we have acquired a vast range of knowledge and technique that we can apply to your specific design. A typical glass company spreads themselves too thin to do any one thing as perfectly as we install Frameless Glass Enclosures. Visit our Photo Gallery to see some of our past projects. What is covered under the 15-Year Warranty? Please check out our 15-Year Warranty page for a complete guide to everything our warranty covers. Can you work with our contractor? Our goal at ShowerMan is to design and install the perfect Frameless Shower Door and Enclosure catered to your specific preferences and bathroom. To accomplish that, we work with your contractor, communicating with them to ensure your shower enclosure is installed precisely and correctly. Am I limited to certain designs? Every customer, every bathroom, every project is unique. With over 40 years of excellence, we have the knowledge and experience to customize your project to fit your specific needs and desires. And, we are so confident in our work that we offer an unprecedented 15-Year Warranty, guaranteeing our design and workmanship will stand the test of time. Visit our Photo Gallery or our Showroom to see a portfolio of some of our past projects and start dreaming of the possibilities we can do with your bathroom! Do you have a portfolio of past work? Throughout the site are photos of some of our past projects, or you can visit our Photo Gallery. For full-sized models of some of our past projects, visit our Showroom conveniently located on Route 9 North in Manalapan. All of those projects have given us the experience necessary to custom-design a Frameless Glass Door and Enclosure for your particular bathroom. How long in advance will I need to place my order? Our Installation Process has been developed and perfected over 40 years. Normally, most typical designs only take 7-10 days to fabricate. Any specialized glass or custom finishes may add additional time. After reviewing our Installation Process, if you have any other questions about our design and installation process, our staff would be glad to answer them at 732-303-9044. What’s the deal with the rubber ducks? As of the beginning of 2016, ShowerMan has given away over 25,000 rubber ducks making children, parents, and grandparents all across the state happy. One of our favorite things to do is to give the rubber duck to well-behaved children to promote cleanliness and good hygiene. During October, all the ducks we give away are pink in support of Breast Cancer Awareness Month. To get a free rubber duck for your child, come in to our Showroom conveniently located on Route 9 North in Manalapan, New Jersey.